Roanoke County, while being a progressive, forward-thinking community, is also oriented towards its citizens, and their enjoyment, comfort and protection. The Roanoke County Fire and Rescue Department provides Fire and Rescue Services to over 90,000 citizens within 254 square miles. The department has 13 stations and 11 districts within the county. In 2007, Roanoke County Fire and Rescue responded to 10,988 emergencies. Roanoke County Fire and Rescue has 150 career personnel (paid) and about 240 active volunteer personnel. The Roanoke County broke ground June 17, 2008 on it's newest fire and rescue station. Located near the intersection of Hershberger and Plantation Road, the $3 million North County Fire & Rescue station will help to improve emergency response times across the county. Construction of the new North County Fire & Rescue station was completed in October 2009. The Roanoke County Police Department has maintained national accreditation since November 1997. Activities such as participating in Neighborhood Watch programs and conducting bi-weekly child safety seat checks and installations keep officers visible in the community. Through this involvement with both the children and adults of the neighborhoods that they serve, the department has earned great praise in the Roanoke Valley and State of Virginia. The Roanoke County Fire and Rescue Department and the Roanoke County Police Department frequently participate in cooperative 911 public education and training, geared towards both students and adults. 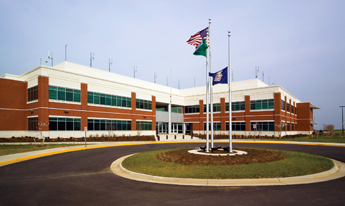 On January 23, 2007, the Roanoke County Police Department moved to its' new location at 5925 Cove Rd, Roanoke, Virginia. The Police Department shares the new Public Safety Center with Roanoke County Fire & Rescue Administrative Offices, Roanoke County Information Technology and The Roanoke County Emergency Communication Center.